In continuous manufacturing of solid dosage forms, continued assurance of process performance and product quality is based on accurate and consistent flow of solid materials. Acknowledging the multidimensionality of material flow properties is often the first step to explore the material knowledge space. In addition, modular operations such as feeding and continuous blending often requires additional material testing for better understanding of process dynamics. As a key element of control strategy, tolerance of incoming material variations needs to be considered. 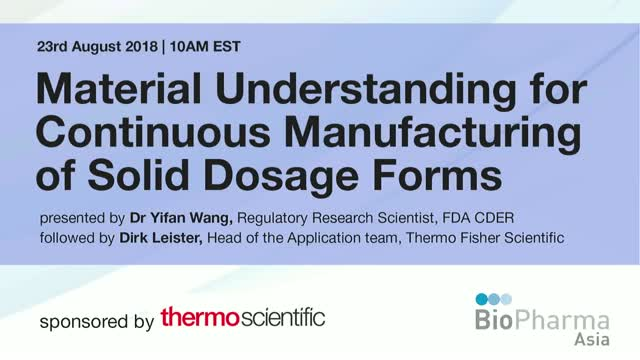 The FDA’s Division of Pharmaceutical Quality Research is working to understand the impact of material properties and explore the material knowledge space for continuous manufacturing of solid dosage forms.